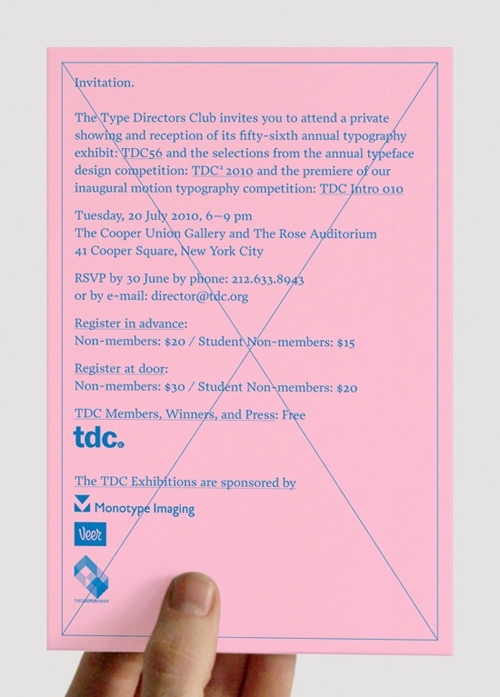 The Type Directors Club is hosting an opening reception event for the "fifty-sixth annual typography exhibit: TDC 56 and the selections from the annual typeface design competition: TDC2 2010." The evening will also include a special screening for the premiere of the TDC’s first motion typography competition (chaired by Jakob Trollbäck): TDC Intro 010. The exhibition opens to the public on Wednesday, July 21st and will be on view through August 19th, 2010. Unfortunately the hours for the exhibit are only from Monday through Thursday, 10am to 5pm. A good excuse for an office field trip? The Typography 31 Annual (designed by Werner Design Werks) is available for pre-order for non-TDC members.